Hi friend! I hope you’ve been having a great week. I just got back from an impromptu road trip to Calgary to see Arcade Fire with a good friend of mine and it was incredible! I’ve never seen them before so it was an amazing experience, even if I am a little worn out from the drive. With that in mind I decided to share a recipe for some cookies I developed ages ago because when you’re tired and want to curl up with a movie sometimes it’s nice to have a healthier treat option to nibble on. Try whipping up a batch to drink with my Life-Changing Maca Matcha Latte, Immune-Boosting Turmeric Tea, Magical Matchaga Latte, or Stress-Busting Hot Cocoa to sip while you’re nibbling. With that being said, I don’t want you to get the idea that baked treats are ever really a “healthy” option. A treat is still a treat, which means it should be indulged in mindfully. However, for those times where uoi do want to indulge, it’s important to use the best possible ingredients you can find. Most cookies are made with inflammatory, highly processed flours, rancid fats, and blood-sugar spiking refined sugars. For this recipe I’ve replaced those sugars with date puree and coconut palm sugar. The dates add a hit of antioxidants and fibre for maximum nutrient goodness, while the palm sugar contains more minerals than regular sugar and has a lower glycemic index. It’s also a great option because it has a really nice caramelly, brown sugary flavour that’s perfect for baking! Instead of rancid vegetable oils we’ll be relying on organic and/or grassfed butter which is chock full of fat-soluble vitamins and nourishing short-chain fatty acids. You can also sub it out for coconut oil if you want to keep these bad boys dairy-free. The ginger in these cookies is a great anti-inflammatory spice and it helps with our digestion while the cinnamon helps with cellular uptake of glucose, which means when you’re indulging you’ll be less likely to experience inflammatory blood-sugar spikes. Cream together dates, sugar, and butter in a large mixing bowl. Add egg and vanilla mixture to butter and sugar. Slowly add dry ingredients to wet. Let chill in the freezer for 30 minutes. Spoon onto greased or parchment lined baking sheet. Top with a sprinkle of coconut palm sugar. Bake 8-10 minutes or until edges are browned. Enjoy with your favourite cup of tea! Well there you have it friend! 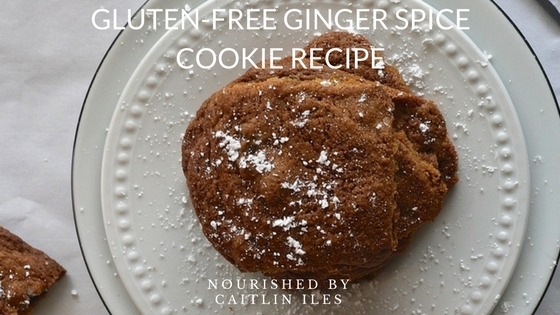 A yummy spiced cookie to satisfy those sweet cravings without all the inflammatory ingredients that can wreak havoc on your skin and waistline. If you’re looking for a way to help beautify your skin from the inside out then make sure you download my FREE Sensational Smoothies E-Book by clicking here. Have a wonderfully whimsical weekend!